Anna Maria Reeves Jarvis was a fascinating woman. Born in Culpepper, Virginia, the daughter of a Methodist minister, in 1832, she died in 1905 — just two years before that first celebration. In her childhood, the Reeves (her maiden name) family moved to present-day West Virginia when her father took a new call. Anna Maria Reeves married the son of a nearby Baptist minister, named Jarvis, and they had twelve children. Only four lived to adulthood. In the middle of the nineteenth century, the expansive world was bringing to these coal counties threats of civil war; battles over slavery; increasing productivity and technology, but also longer hours and dangerous working conditions – child labor laws were hardly a thing. Thus, Anna Jarvis in the 1840s and 50s organized a series of (what she called) “Mother’s Day Work Clubs” – designed to bring the wise domestic eye of women into deplorable living and working conditions, to improve health conditions for many families. Jarvis’ first Mother’s Day Work Club raised money for medicines, deployed women to work for families in which the mothers suffered from tuberculosis, and inspected bottled milk and food. By 1860, local physicians and mothers had spread this work to at least 15 other towns. While the civil war raged on, making their little West Virginia county a strategic stop along the Baltimore & Ohio Railroad, Jarvis urged the Mother’s Day Work Clubs to provide relief and medical care for any and all – whether Union or Confederate. The clubs treated the wounded, and fed and clothed soldiers stationed in the area. Jarvis helped preserve peace in a war-ravaged town by focusing on a common mission in which all could participate. In fact, after the war, she and her family moved to a larger nearby town only to find that tensions between North and South had escalated due to the political bickering surrounding Reconstruction. In the summer of 1865, Mrs. Jarvis organized a Mother’s Friendship Day on the courthouse steps in Pruntytown, WV, to bring together soldiers and neighbors regardless of their confederate or yankee leanings. Many feared that the day would erupt in violence, but it turned out to be a great success. That celebration continued for many years. For the next forty years, Anna Jarvis led this Mother’s Day movement, a movement of mothers standing up against poverty, war, injustice, and bigotry. Alongside her husband and family, she was committed to the idea that in a violent time, with the ravages of warfare and industry, the voice of women – in particular, the wisdom of mothers – was a deciding factor between death and life. Two years after her death in 1905, then, it’s easy to understand why her daughter, Anna Jarvis, would want to celebrate her mother’s legacy — organizing a “Mother’s Day” on the second Sunday in May, 1907. 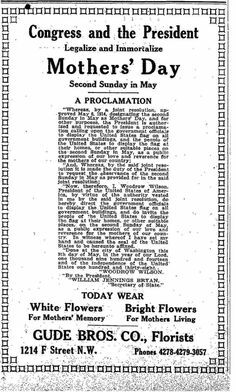 Fast forward seven years: President Woodrow Wilson made the second Sunday in May – now called Mother’s Day – a national holiday. That year was, of course, 1914, and this nation was faced with a new threat: a world war that threatened to destroy many advances of human civilization, and nearly did. This seemingly quiet and quaint second Sunday in May is nothing short of a call to peace, a call to stand up for justice, a call to embrace the values that this world so easily trumps down, underfoot, yet which Jesus called us to embody. This is something the world laughs at, frankly. Peace? What does that have to do with the issues we confront today: war in our streets, threats of terrorism, racial strife and ongoing tension. Peace? And how can you show us, Christians, what peace you have brought to this planet in the last two millennia? Peace? But Jesus’ peace is given on a night, long ago, in the midst of his own anguish, pain, anxiety and dread. Jesus’ peace does not wipe away war, neither those outside nor those inside which set people apart. Jesus’ peace doesn’t alleviate our anxiety, like taking a pill at night. The world still feeds on violence and bigotry, hatred and destruction and – yes – it’s all caused by people just like you and me. We live, today, in deadly times. We always have. Jesus’ peace, however, is a gift that moves us to act toward justice. Jesus’ peace is a reality that, deep down, we are already redeemed. His peace is activated when we use it, not only to comfort the brokenhearted but to mend systems of oppression and exploitation, at least so we are no longer completely entangled in them unaware. “Do not let your hearts be troubled,” Jesus told his followers long ago (John 14:1), for the peace he was giving them was none other than his own. (John 20:21-23) Use it. Someone we might remember this weekend, named Anna Jarvis, believed so much in the strangely counter-cultural values of justice, peace, womanhood, goodness, and compassion that she stuck out her neck in a deadly, blood-lusty time. She risked faith, and was redeemed. And you and I remember her, or at least remember her day for it. Or do we? Honestly, how many thought of the second Sunday in May as an invitation to justice? a call to be about peace-making? For the longer ending of the story is that Anna Jarvis, who sought to lift up her mother’s memory in establishing this holiday, died in utter poverty, having spent everything she and her sister had to de-commercialize the holiday. As early as fifteen years after President Wilson established the Second Sunday in May as a holiday, Anna Jarvis was disgusted by how quickly it grew into a buying spectacle and how suddenly it lost its focus on what her mother worked so hard to claim – a focus on mercy for the downtrodden, compassion for the prisoners, justice for those broken by oppression, and peace for all humankind. Perhaps that’s the Christian story in a nutshell: future generations might not know us for our great deeds and monumental tales but we do them nevertheless. We stand against violence and war-mongering. We love the downtrodden. We clothe the naked. We feed the hungry. We tend the poor. Not because it’s popular, but because it’s right. And the right, the only way to peace. An earlier version of this post was published on The Episcopal Café on 8 May 2011.